Rollo, J. (et al.). 2013. 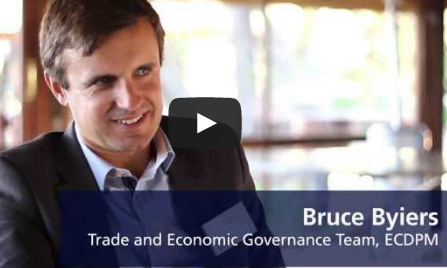 Potential effects of EU-US economic integration on selected developing countries. GREAT Insights, Volume 2, Issue 8. November 2013. Maastricht: ECDPM. This paper is based on a report (1) (2) commissioned by the UK Department for International Development (DFID) from the Centre for the Analysis of Regional Integration at Sussex University (CARIS), InterAnalysis Ltd (IA) and ITEAS Consulting Ltd. The remit was to look at the impact of the proposed Transatlantic Trade and Investment Partnership (TTIP) on 43 developing countries (LIC from now on) (3). The analysis took three main routes: a qualitative analysis drawing on the Sussex Framework (4) for analysing free-trade agreement (FTA), using TradeSift (TS) Software (5) and focussing on impact of potential preference erosion on the top 20 LIC exports to the EU and US at Harmonised Commodity Description and Coding System (HS) 6-digit level. This also took account of LIC competitiveness relative to EU and US exporters and the incidence of non-tariff barriers (NTB). Second, a Partial Equilibrium (PE) econometric analysis of the potential impact of changes in the tariffs facing EU and US exporters in each other’s markets. Third, a qualitative analysis of the performance of the LIC in dealing with existing EU and US Sanitary and Phytosanitary (SPS) rules as well as technical barriers to trade (TBT) in the textiles and clothing sector and possible implications. 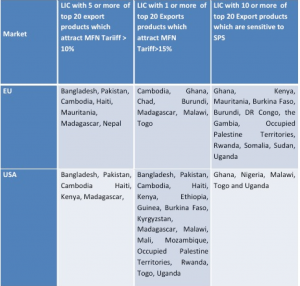 a few top export categories by 23 other LICs to EU and US appear sensitive to high MFN tariffs or SPS rules. 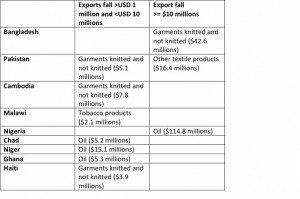 for Bangladesh, Cambodia, Haiti (US imports) and Pakistan clothing exports, the drop to either the EU or the US ranges up to 18%. countries not coping currently will face further difficulties if regimes change as a result of TTIP. Even at HS 6-digit level likely effects are judged to be small (mainly because competitiveness is strong), but may require individual countries to drill down to EU/US tariff line data to be sure. Options are limited: LIC are not in the negotiating room, so their lobbying strategies are limited. – ex post they could pursue compensation under Article XXIV of the General Agreement on Tariffs and Trade (GATT); this is rather unattractive, however, since it would involve a potentially long wait. They could lobby for LIC export products which face high MFN tariffs to be excluded from TTIP liberalisation schedules, i.e. be added to any EU and US sensitive products list (but the scope is limited and would be subject to the liberalisation of “substantially all trade” under GATT Article XXIV). 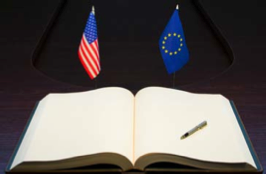 On regulatory integration, they could ask for the inclusion in any Bilateral Mutual Recognition Agreements and/or aid from the EU and the US to help with adaptation to any new regulatory requirements resulting from TTIP. enhanced cooperation for the development of rules and principles on global issues of common concern and also for the achievement of shared global economic goals. As a practical matter, bilateral services trade data between the LIC and the EU or US is poor so the focus is on trade in goods and on tariffs, SPS and TBT in particular. Average MFN tariffs in transatlantic trade are low (around 4%) which suggests there will be little effect either in transatlantic trade or on third countries from a traditional FTA. 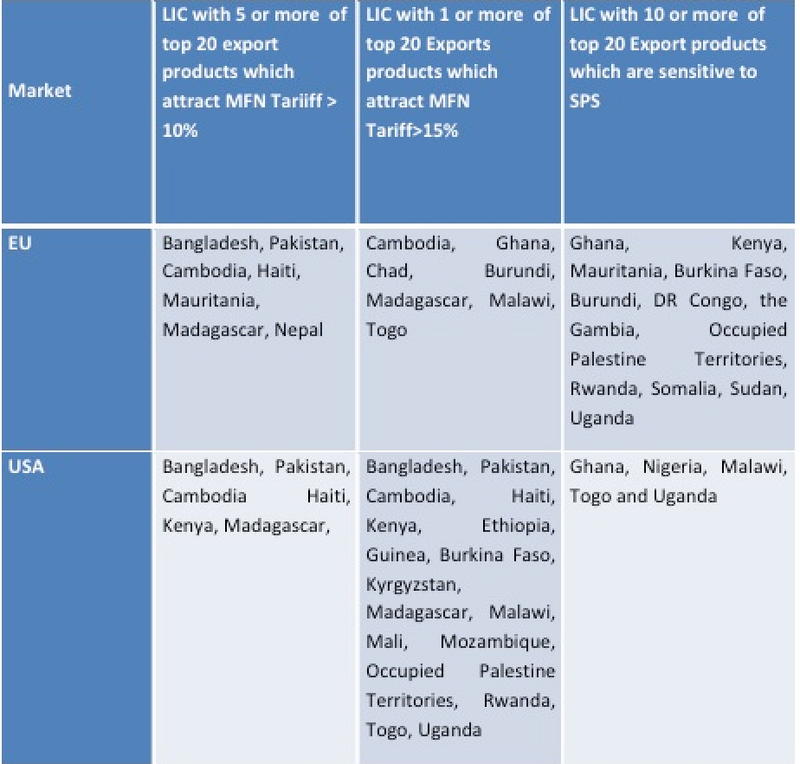 However there are individual tariff lines where MFN tariffs are high and some of these are for products of importance to LIC. Both the TradeSift and the Partial Equilibrium analyses drill down to 6-digit product level searching for high MFN tariffs in products of interest to the LIC in EU and US markets. First, the non-fuel imports of the EU and US from the LIC are highly concentrated with 60% of EU and 83% of US imports coming from four countries – Bangladesh, Pakistan, Cambodia and Ghana. 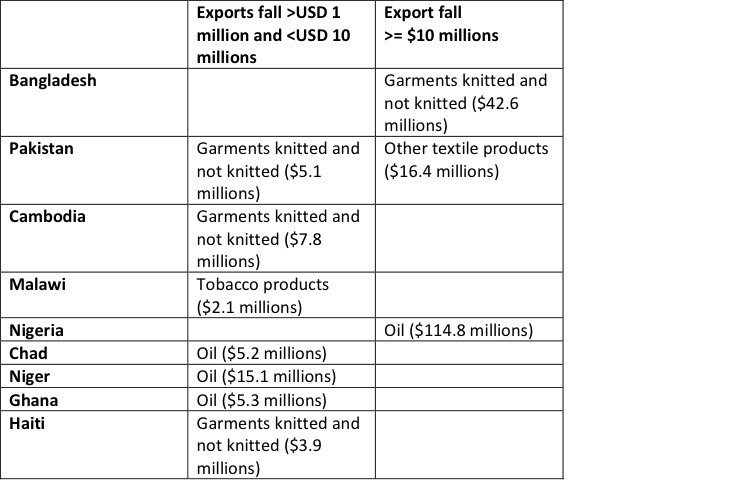 Second, the top 20 products (textiles, clothing and footwear mainly) imported from Bangladesh, Pakistan, Cambodia face high MFN tariffs, typically above 10% and some above 15%, so there is a potentially significant boost to US and EU price competiveness from their removal in a TTIP. These countries, however, have high import shares and high bilateral revealed comparative advantage (RCA) in these products relative to US and EU suppliers. Third, the EU and US’s non-fuel imports from Ghana generally face low MFN tariffs. In the EU however, fish and banana imports face MFN tariffs above 15%. In both the EU and the US, ten of Ghana’s top twenty products are exposed to SPS measures. 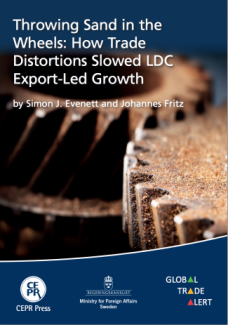 Fourth, for the remaining 39 countries of the LIC, MFN tariffs on their top twenty products are low and the risk of their trade being displaced is also likely to be small. But there are outliers and 26 LIC face some potential disadvantages from the successful completion of the TTIP. Table 1 provides an overview of LIC potential sensitivity to the TTIP. The technical details of the model underlying the results in Table 2 are set out in Part 4 of the main report. For ease of presentation, the focus here will be on the largest effects by product and country summarised in Table 2. The first point to note is that the partial equilibrium results include oil products which are of particular interest to West African LIC. If there is little room for substitution of sources of supply then changes in tariffs may only have small effects on oil trade flows. Beyond oil, the products from the garments and textiles categories in Bangladesh, Pakistan and Cambodia are most affected. US Tariffs on some tobacco products are of the order of 70% hence the vulnerability of Malawi to potential imports from the EU. On SPS stoppages, data suggest that Afghanistan, Gambia, Ghana, Guinea, Kyrgyzstan, Madagascar, Mauritania, Mozambique, Myanmar, Pakistan and Yemen already have difficulties meeting EU rules on fish, nuts and dried fruit. On the other hand, Kenya, Tanzania, Uganda, Zimbabwe and Zambia seem to manage EU and US rules effectively. This may suggest that any harmonisation towards EU norms would provide difficulties for the first group of countries whilst the second group might find such a harmonisation easier to handle and perhaps even beneficial. TBT issues are more complex in particular with the mix of public and private standards, notably Globalgap in the food market where transatlantic approximation is going forward. This is true in the context of the EU Reach Directive on Chemicals where the US is gradually converging for both labelling rules and standards for textiles and apparel on the use of Azo dyes. The language of the HLWG report however did not signal great ambition for regulatory integration. The main area of uncertainty is whether the EU and the US attempt harmonisation as with Azo dyes or prefer mutual recognition. Harmonisation could reduce the costs of differing standards to third countries. Mutual recognition, if not offered on an erga omnes basis, could be discriminatory against countries that can establish equivalent standards regimes. The LIC are outside the negotiating room when the two largest trading areas in the world sit down to discuss increased economic integration. The LIC have maybe more to fear than most third countries since the high MFN tariffs in transatlantic trade are concentrated in areas where they trade intensively. Removing these high tariffs will potentially offer EU and US producers a major improvement in price competitiveness over the LIC in each other’s markets. However, for the main LIC exporters, their competitive advantage in these products is very strong and their potential to remain competitive also seems strong. There is not a lot of room for increased preferences to compensate since many of the LIC receive duty free access already. The main exceptions are Bangladesh, Pakistan and Cambodia in the US market where their top 20 exports also pay MFN tariffs alongside EU exports. Giving them zero tariffs would put them back on equal basis with EU producers. Similarly, giving the LIC as a group equal access to any mutual recognition agreements in the regulatory field along with aid to help their producers meet testing and conformity assessment rules would also help to reduce LIC anxiety about regulatory integration in the TTIP negotiation. 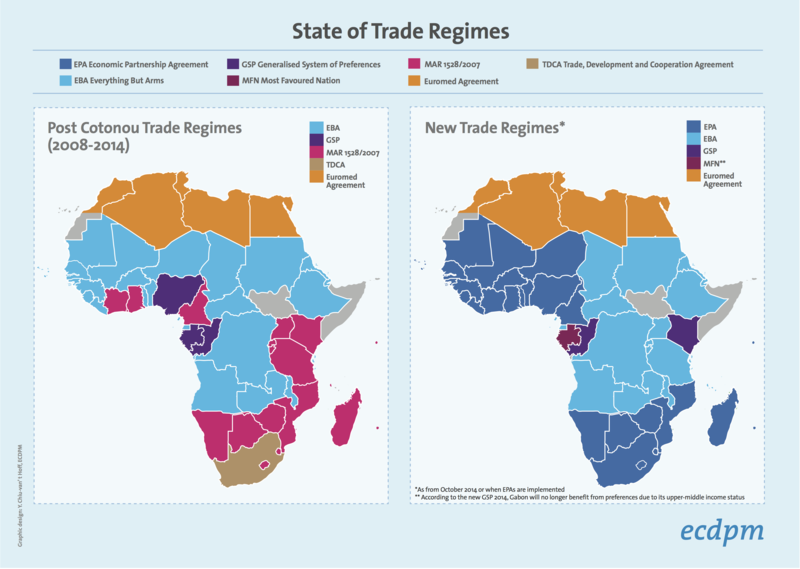 However, mutual recognition agreements do not work easily even between countries that actually achieve equivalence in their regulatory infrastructure. 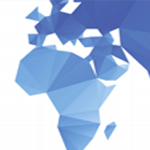 Jim Rollo and Peter Holmes are trade economists at InterAnalysis Ltd. (IA) and the Centre for the Analysis of Regional Integration at Sussex University (CARIS). Max Méndez Parra is a Junior Researcher at CARIS and also works at ITEAS Consulting Ltd. Sarah Ollerenshaw is Economics Operations Manager at InterAnalysis Ltd.
3. Afghanistan, Bangladesh, Congo DR, Ethiopia, Ghana, Kenya, Kyrgyzstan, Liberia, Malawi, Mozambique, Myanmar, Nepal, Nigeria, Palestine, Occupied Territories, Pakistan, Rwanda, Sierra Leone, Somalia, Sudan, Tajikistan, Tanzania, Uganda, Yemen, Zambia, Zimbabwe, Benin, Burkina, Burundi, Cambodia, Central African Republic, Chad, Comoros, Eritrea, The Gambia, Guinea, Guinea-Bissau, Haiti, DR Korea, Madagascar, Mali, Mauritania, Niger, Togo.